Just a small correction. I think the "k." = königliches. To be continued (but I can't show all my dog tags !). thank you for participating in this thread by posting your excellent specimens. Lt.d.R Mavors is from August 1914 until March 1915 with 6. Batterie, 4.bad. Feldart.-Rgt.66 - after that he is no longer with the Regiment. Hi Stephan, I have some more of such ID tags. Hi Chip, I have looked into all my "Ranglisten", from 1890, 1897, 1901, 1910, 1913 and 1914-1918, no hit for Winkelsträter. 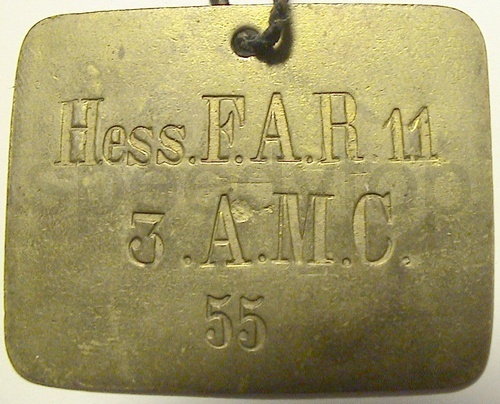 I think it stands for "Artillerie-Munitions-Colonne"
Here is a staff officer's tag from a member of a well known military family. 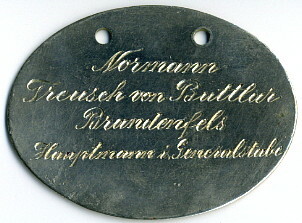 "Normann Treusch von Buttlar Brandenfels, Hauptmann im Generalstabe". I think it's for "3te Artillerie Munitionkolonne" (with a "C" instead of "K" ???) or "3te Companie des Artillerie Munitionkolonne". I don't think this, because there is no Artillerei-Munitions-Kolonne in a Regiment. And a Kolonne is definitely in that time Kolonne, and not Colonne. Here are some 1916 type. 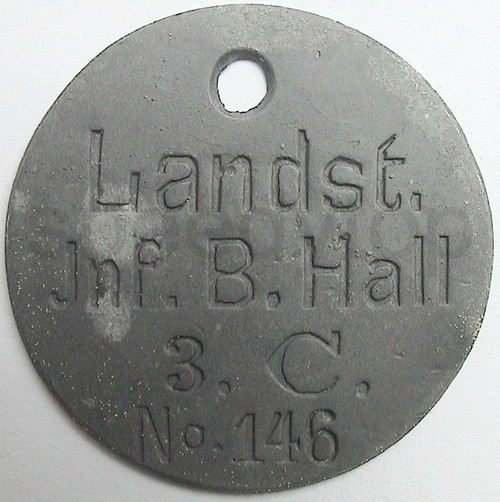 Following dog tags are not so nice but stampings are interresting.